Life with Lynnie: J's Graduation! Last Thursday evening was a special one. Truly special. Not just for me! Also, for my daughter B, and my grandson J, who was graduating from Grade 8. My instructions were to meet at St. Anne's Catholic church, in the town of Tecumseh, about 5:30 p.m. I got there on time. The crowd was enormous! While I managed to find a place to park, in the overflowing parking lot, I didn't see my family. Inside I went. Looking around, I realized that if I didn't find a seat soon, I probably wouldn't find one, at all! The sanctuary was almost full. And, the ceremony wasn't due to start until 6:00 p.m.
After enquiring at several locations, I finally found one (1) seat. That's right! I couldn't find enough available seats for the rest of my family, who were to meet me, there. J's school obviously had several Grade 8 classes, for there three (3) teachers, in addition to the Principal and Vice-Principal. Eventually, I saw my daughter B, J and a close friend walk into the sanctuary. B and her friend managed to obtain a seat at the very back, where ushers had added extra chairs. J returned to the hallway, where his peers were awaiting instructions to join us. When the ceremony began, J was one of the first three (3) students to speak at the podium. He did a great job! I'm proud of you, J! It never ceases to amaze me that these days, young people dress in such a way that it would break the bank. 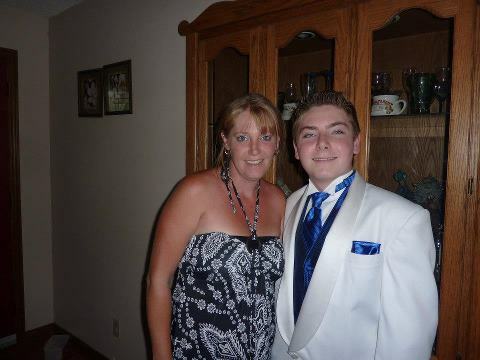 B had previously rented tuxedos for my other grandsons, when they graduated from grade school. This time, she did so again. With a bit of a different twist. J wanted to be different. He wanted to stand out from the crowd. He wanted his tux to be white! One thing I was sad about, was that I forgot my camera at home. I couldn't believe I had done this, but I had. I was glad B was able to take some great shots! While I have a wonderful photo of J in his white tux, surrounded by a group of his friends, dressed in black suits or tuxedos, I feel I cannot post it. Usually, before I post a pic, I ask for permission from people in the photo. In this case, I wasn't able to. My daughter B, and my grandson J, looking rather spiffy! One thing that surprised me was how long the graduation ceremony was. By the time I exited the sanctuary, it was well over (3) hours that I had been there! However, it was such a blessing, to be able to see my grandson graduate! Afterwards, the graduates were having a dinner and dance, in the church hall. B had to go pick up my granddaughter, so I headed home. What a joyous occasion! I couldn't help but recall my own graduation dance, when I graduated from Grade 8... and the fellow who escorted me. Those memories, just don't seem to leave. Hopefully, J will recall with joy his memory of this special time in his life, too! Speaking of joy! It's with a joyous heart, filled with thankfulness, that I praise God and thank Jesus that I could be there, that evening. But, I am also joyously thankful that it was part of God's plan for J's life, as well as mine! This reminded me of Psalm 47:1, "O clap your hands, all ye people; shout unto God with the voice of triumph." Even though this verse is directed not to situations like the occasion of celebration that evening, and even though I realize it is meant to give God honour, it seems to relate well to the circumstance enjoyed. After all, not only did J triumph, by graduating, but God is leading my grandson, guiding him into another era of his life. Congratulations, J. Always remember that Jesus loves you, and so do I!